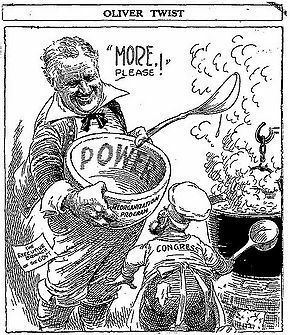 Later programs are known as the Second New Deal and were implemented between 1935 to 1938. One of the first things President Roosevelt did was to close the banks in what he called a “bank holiday.” Congress passed the Emergency Banking Act which allowed for banks to reopen under the supervision of the Federal Treasury. This stabilized the banks and brought back confidence in the banking system. The Securities Act of 1933 was passed to prevent another stock market crash. It required companies to provide accurate information to the public including profits, losses, and corporate officers of the company. A large program for public works started. This program built roads, bridges, schools, hospitals, and dams across the country. These programs provided jobs for many people. 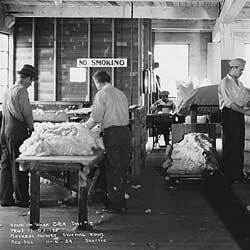 To help farmers out, the Agricultural Adjustment Administration (AAA) was implemented. It helped to improve farming practices, reduced farm production to raise prices. It had a positive impact in American rural areas. In order to get the housing industry going again, two new agencies were formed: The HOLC was formed to help refinance mortgages and to help people keep their homes. The FHA put government standards on the construction of homes to make sure that homes were safe. It also helped to insure mortgages and stabilize the home mortgage market. 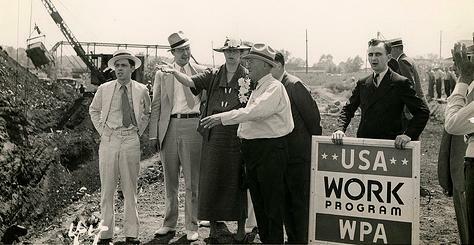 The Federal Emergency Relief Administration provided help for the unemployed. It built soup kitchens to feed people, provided blankets to the homeless, lunches for schools, and educated people on how to find a job.